Drag queen Beatrix Lestrange's grandmother would tell her stories of crossing the Rio Grande for a better life. The migrants 'could have been any of us." HARLINGEN, Texas — Drag queen Beatrix Lestrange, whose real name is Joe Uvalles, is wearing a neon multi-colored dress, a red wig and a pair of black pumps. She’s standing in front of a full room of mostly baby boomers and is ready to call out numbers for bingo. 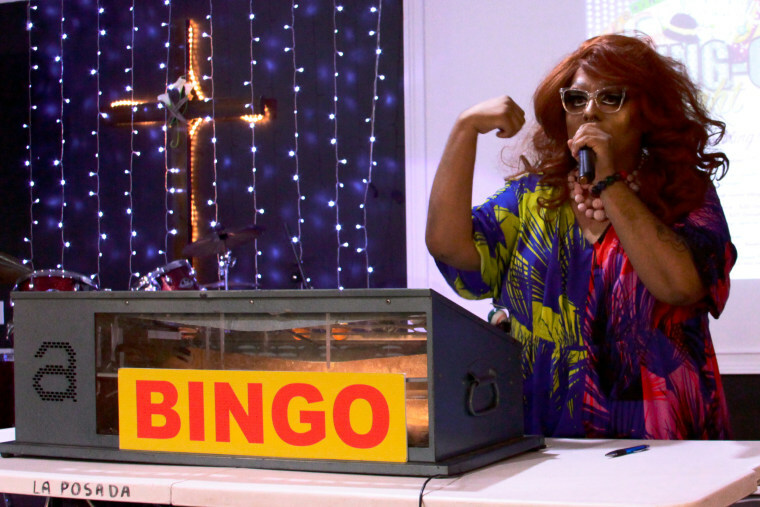 Lestrange, a self-proclaimed ‘dragtivist,’ was hosting a game of bingo, but it was slightly different. In this "Bling-o," the players competed for donated jewelry instead of cash. Bling-O was the result of a web of unorthodox partnerships. Lestrange was invited to support La Posada Providencia at an LGBT-friendly Christian church in the Rio Grande Valley of south Texas on the U.S.-Mexico border. What brought the groups together? A shared crusade for immigrant justice, where participants paid a fee at the door, which all went to the shelter. The Rio Grande Valley has been in the national spotlight after President Donald Trump deployed thousands of soldiers along the U.S-Mexico border and has installed barbed wire on some parts along the southern border. According to Customs and Border Protection data, Border Patrol has apprehended more people in the Rio Grande Valley sector, though the numbers are drastically lower than those in the 1980s and 1990s. Most of La Posada’s clients come from detention facilities in the Rio Grande valley, though some could have been transferred to those facilities from any port of entry in the U.S.
Atkinson said the shelter provides a safe place for immigrants seeking asylum to locate and make plans to travel to friends and family after they are released from detention. “At La Posada, basically what we do is we help people finish their journey,” Atkinson said. Before working for the shelter, Atkinson began her immigration activism through a United Methodist Women group. She explained that her idea to ask a drag queen to host the event came after she saw Lestrange marching at an ACLU rally protesting the separation of parents from their children at the border. After Lestrange agreed to host the Bling-O, Atkinson needed a location to host the event. She reached out to Pastor Ali Lopez of Mount Calvary, a church run by LGBT people. Pastor Lopez said she never hesitated to say yes to Atkinson’s request and wanted to help the migrants in La Posada’s shelter. Lestrange is no newcomer to activism in the Rio Grande Valley. Last year she created Drag Out HIV where she and other local drag queens used their platforms to raise awareness about the high rate of HIV in the area. She says she jumped on board this event because, for her, the issue of immigration is especially personal. "That could have been any of us"
Through Lestrange’s activism in the Rio Grande Valley she says she’s heard other local Latinos and Mexicans talk down about the situation on the border. Among the attendees was Eunice Lerma, an associate professor in counseling at the University of Texas Rio Grande Valley, who came to the event with friends. Lerma said she felt inspired about how a largely senior crowd responded to the drag performances of Lestrange and her guest Ariel C. Brooks. “To come here and see these older generations, just embracing and loving and clapping, they put this together, this is awesome,” Lerma said. The work isn’t over for Lestrange after the “Bling-O” event. She says she will continue to mobilize within her community to help immigrants seeking refuge and hopes people will follow her philosophy. “If I can do this work in wig and heels, then anyone can do this work,” Lestrange said. Maxwell Parrott is a freelance journalist who has written and reported for City and State, amNewYork, The Texas Observer and In These Times. Parrott is finishing his Master’s degree at the Craig Newmark Graduate School of Journalism at CUNY where he is focusing in business reporting.